So just to sum up real quickly - this has been a very bad week for me. Just all kinds of stuff from lousy traffic to work sssues to lost passports, anything that can happen seems to have happened this week so boy was I looking forward to getting on the water. Mike spend last weekend on Georgian Bay and lay a beating on the smallies so we wanted to see if we could repeat. Sure the weather is 100% different but who cares. I was looking at his spinner bait thinking one more by Mike and I was switching up. Sure enough shortly after he's got another nice smallie on. As I mutter about where my spinner baits are I offered to help land it. I leaned over and saw that the fish wasn't very well hooked but pashawed Mike's net comment and grabbed the lip. Of course that's what the fish was waiting for and he gave a solid shake the all of a sudden he no longer has a hook in his mouth OR my hand on his lip. I couldn't believe it - there was Mike's big smallie just sitting there mocking me from the water. Of course I did what all people who haven't quite woke up enough would do - I grabbed for the little bugger. Sure enough he laughed and swam away and just I realized how pointless that attempt was I realized that my center of gravity was now about a foot two OVER the side of the boat. I made a couple desperate flop attempts with my legs to stop the inevitable but in to the drink I went . My first thought, was "you IDIOT", second was "hey the waters pretty warm". Luckily Mike decided to help instead of just grabbing the camera and shooting away while laughing to which I'll be forever in his debt and I was soon back on the boat feeling very good about my decision to put everything that was in my pockets into my tackle bag when we left the launch. No injuries, no lost or broken gear, even my hat and glasses stayed on - if I was going in at least I did it right. I realized however that I was wearing all cotton clothes and it was still cold and raining out . Luckily Mike has fallen out the boat in the past and is smart enough to carry a spare sweathshirt and pants in the boat so a quick change and I was back in the game if a bit chilly. So yeah - the week of all things sucking ends with me falling out of a boat - couldn't have planned it better myself. And that was pretty much it for the day (couple other little guys we didn't bother taking pics of). Small (think beetle bug spinner size) spinnner baits in white did the best though I lost one on a white xrap as well and we landed a couple on more regular sized white spinner baits. Productive areas included 7-10 feet of water with mixed weeds coming up to about 2 or 3 from the top (not thick thick weeds but not barren). Top water was working as well when the wind was low (frog pattern skitter pop and blue/white pop'R) over rock piles and some weeds. Couple fish also came on pink senkos wacky rigged on rock/weed lines right up near shore. If you'll excuse me now I have to go dry out some clothes and put spare shoes in my trunk (driving home from BPS where Mike and I met up in cold wet runners is no fun). Thanks for the report. Falling out of the boat isnt stupid I maintain as one who has done exactly that, so your not alone. An interesting, if not comical read. Some nice fish there to atone for your misfortunes. All I can think of is "Heeey Yaabbaaaat"
LOL Sean at least it was into clean water and not a shoreline slip into muck. Great fish though and this story reminds me I have to pick up one of those portable heaters! Some nice smallmouth bass there! About a year ago i fell off Mike's boat as well, but had no change of clothes. Some decent fish there, as for falling in the water i had a few close calls myself all in all nice report guys. Couldn't help but chuckle as I read this report, but not too much as I know my turn will come. Sean, really enjoyed your perspective on this.......some might have felt falling out of the boat was a lousy start to a weekend after a lousy week, you found the humor and continued on...good for you!! I will be packing extra clothes in the future, thanks for the tip! I suppose Mike couldn't be to upset at the loss considering your effort LOL! It reminds me of the Bass I catch in the the Saugeen. Fishing and laundry done all at the same time.....who'd of thunk it. Been there and done that, thanks for the laughs. Certainly glad you were not hurt Sean. A few nice fish certainly makes up for the swim. Interesting to here you say small baits were the key, all of my fish on Saturday were on small plastics but Bly's muskies were very willing to chase a fair sized spinnerbait. Thanks for the report. Great Report and some nice fish!! I have also fallen in the water trying to revive a Musky! great report Sean, having the extra clothing in the boat sure paid off, as soon as Sean changed we were back fishing like nothing happened. As you mentioned I fell out of my old boat a couple of years ago, as I was going from the back deck to the front deck , I was wearing sandals and slipped into the water. Whenever I fish by myself I wear my life jacket as accidents do happen. 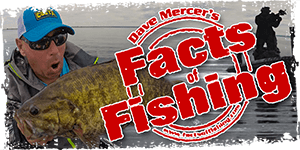 The fishing was slower than the week before, but there was a difference in temperature 26 vs 17 degrees plus it was raining. Overall I thought it was a good day and we managed to stay out of the wind most of the time. I'd like to say I didn't laugh when I read the report, but I'd be lying....LOL. I managed to get through the report without laughing, but that line really cracked me up. 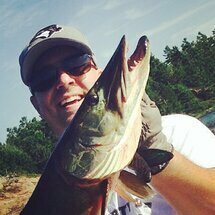 Johnny falling in beside a muskie would've been something to see. Sean, I know it was a crappy week, and falling in sure isn't fun....but as falling in goes, you really pulled it off well! The camera stayed dry, your pics stayed safe, you still had car keys etc when you got back out, and there were dry clothes waiting for you. Bravo! I've gotten into the habit of zipping keys/wallet/cell/etc into my boat bag before I take it out of the car. Jeff lost his cell in the weeds under the dock last year, and I don't want to give him the chance to laugh at me for doing the same thing. There's always a pair of track pants and at least one shirt in my bag, but I'd only been thinking about staying warm after sundown. Thanks for making me take falling overboard into consideration! Good write up, wish I can see the pics though. I fell out of a tinny some years back after I stepped on an open tray of lures. No one was around, but I laughed to, and at, myself all day. Thanks for sharing. GREAT REPORT!!!! man that was funny....sorry...but i had to laugh, but hey...10/10 for carrying on! Great fish you had there....and i like the 'technical summary' bit at theend.